Cardinal Cupich consolidates for some big pushing on a national scale. In the works for quite some time from his seat on the Congregation for Bishops, Cardinal Blase Cupich’s much-anticipated backup has arrived – at Roman Noon, the Pope named three auxiliary bishops for the 2.4 million-member archdiocese of Chicago: Fathers Ron Hicks, 50, the vicar-general; Mark Batosic, 56, until now chaplain of the Cook County Jail; and Robert Casey, 50, until now pastor of the city’s St Bede Parish. Young, vigorous, accomplished, eminently appointable. Cupich’s first batch of deputies since his arrival in late 2014, the bishops-elect were all classmates at Mundelein and ordained priests together by Cardinal Joseph Bernardin in 1994. With the triple nod, the number of Stateside auxiliaries added to the bench within the last two years now stands at 25. Preparing the way for winning the next national bishops’ meeting vote for head man. And for proliferation of future bishops in charge of whole diocese. Francis’ man in Chicago and the U.S. gains a lot here. From the diaspora: Panhandlers differ, Out damned tooth . . .
From my observation post outside Starbucks: A “craft ice cream” truck tools down Bryn Mawr, 9 or so on a Tuesday morning. We already have craft beer. What else? I’ll tell you what else, craft writing, as by Yours Truly and his ilk. Not crafty, though the temptation is always there. Across the street, opposite corner, a young fellow in red shirt and wearing white do-rag is panhandling more aggressively — here in historic Edgewater — than I see on Clark Street a half mile west. He’s able-bodied, able enough to lean toward, though not into, passersby. I gave him my usual buck a half hour ago, before planting myself here with iced coffee on an absolutely halcyon day, glorious in the low 70s, blessed with now a cool breeze, now a warming one, the Big Lake mere blocks away. He took the buck blank-faced, in contrast with his Clark Street counterparts, whose responses are human enough — saying thanks sometimes, sometimes asking for more, in one instance asking me what I’m reading, for cryin’ out loud, taking the book of poems and reading from it aloud with a smile. Full of chatter when we met later on the Broadway bus. For another I bought breafkast “britos” (burritos) at McDonald’s. Another time, barred by the manager apparently for border-line antisocial behavior, he asked me to get them for him, handing over two singles. Got life story from him in a series of encounters. Another gave me a story on our first meeting: mother died day before, wife and three children hungry, he won’t get paid until Friday. My dollar led to request for more which proved unavailing. Back to my post outside Starbucks, NE corner Bryn Mawr and Winthrop. Weekday, people on the run, in a hurry, except for the likes of me and a few other oldies with time to kill with over coffee, mine iced, sipped with a straw in violation of post-extraction rules. Extraction was previous day, of a rear tooth long past its prime, like the mouth and entire body of its home for 80-plus annos. And (b) located in area not easily reached by brush and floss and therefore vulnerable. It was doomed and had to go, which if it sounds like the plight of man on earth, so be it. Hang on and look to the heavenly father. Extractor of this miserable excuse for a tooth deserves noting. She is the beautiful Dr. N., intelligent, impeccably professional, skilled, a 30-something Asian-American woman whom I decided to be of Chinese extraction, if I may use word in this context. More later from the Oak Park diaspora, North Side chapter . . .
Chi Trib front page clashing stories: two kinds of weeper . . .
Make-up editors could have put them side by side as horns of the dilemma faced by lawmakers as regards public spending: 1) people want services, 2) government hasn’t got the money. Democrats have resisted Rauner’s calls for mixing into budget discussions other issues including cost-saving changes to workers’ compensation, state-employee pension-benefit programs, and a local property tax freeze, among other things. No, no, no, don’t touch our workers’ comp, state employees’ benefits, and property taxes, say Dems, clutching these items as dear to their hearts. including that Gov. Bruce Rauner sign a school funding reform bill that the governor has said he would veto. Crafty fellow. Oh, and a Democrat. Chicago’s Andrew Sa closes the evening off at 10, right after Hey Chere! at 9. It’s the happiest sad music around! Inspired by the plaintive, wild sound of Dennis McGee and other Cajun greats, Hey, Chere! plays early traditional Cajun music, a close cousin to high-lonesome old-time and early country. Angela Bowman, featured on fiddle and voice, has taken this short step from country to Cajun, joined by Sean Colledge (Le Travaillant) on accordion and fiddle and John Huber (The Wandering Boys, the Lantern Kickers) on guitar and t’fer. Evening begins at 8 with Steve Hinds and John Huber on fiddle and guitar. Fun! He is Robert L. Hylard, who cashed in at 86 and remained loyal to his school to the end. Pat Hickey tells us about him. the Kid from VIZ [Visitation parish, 55th Street] who played in Leo’s Marching Band for four years, wrote for and helped edited the school news paper the Oriole, ‘trod the boards’ in every Leo Dramatic production from junior year on, and played lightweight football on the cinders and broken beer bottle glass of Shewbridge Field – the iconic home to Leo High School football, now Amos Alonzo Stagg Elementary. He is remembered with affection. The young African American, Mexican and Canaryville Irish kids who now attend Mr. Hylard’s Alma Mater knew him well. Bob Hylard made all of the football home games, most of the away and every Leo High School event that showcased the talents and skills of our young men a huge mark on his calendar. 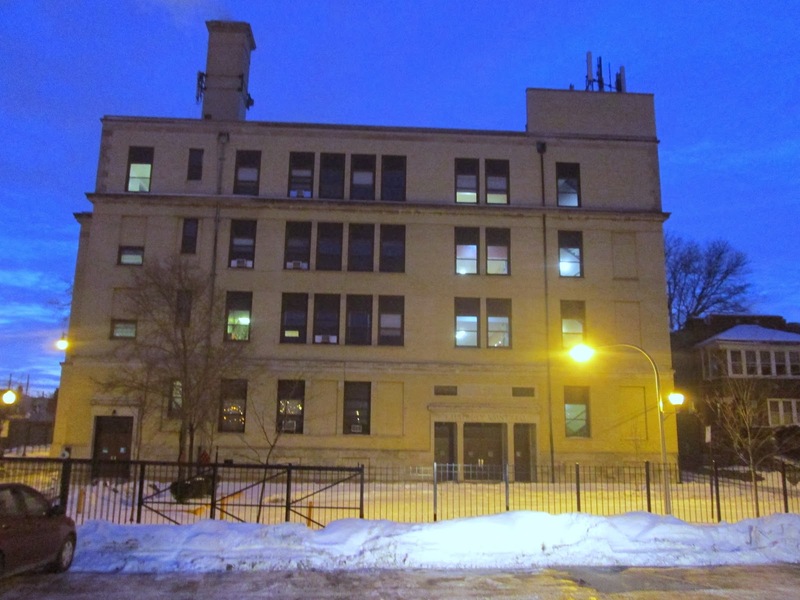 Leo remains a boys’ school, vigorously supported and operated by its mostly (S. Side) Irishers, a haven of excellence in a rough neighborhood. Leo HS Morning 2/11/2014 -I Ride With Pride and Clyde By My Side! I am blessed with a great life and the opportunity to work for Leo High School. I get to Leo at about 4:45 most days and start the boilers, do some paper work and get the one of the vans ready to pick up between seven and nine guys participating in early morning activities. My crew is usually Cyde, Chris, TJ, Mick, Joe, Latrell, Caleb, Gaylon, and Sydney. I begin in Englewood at 74th & Normal, go to Grand Crossing at 66th & King Drive, take that beautiful, historic and inspiring Boulevard north to 35th and Dunkin Donuts! For more more more . . . Take it away, Hickey . . . The lakefront ride of Maggie B. Our bike ride took us through the crowds of Fullerton, North ave, Oak St, and Navy Pier. And past that it was a blissful ride down to Promontory Point, where we swam off the rocks. A woman in her 70s told me the water was very nice, much better than yesterday, when it was quite chilly. This was confirmed by another bather of the same age, emerging from the water after swimming in from a far out place. Do you come every day, I asked her. Oh yes, it’s an addiction, she said. Today I swam out to the fifth buoy, then cut towards the beach, then back along the wall. I didn’t bring my goggles, I told her, so I’m not sure how far I’ll go. Do what you can, she said. So I did. Breast-stroked it to somewhere between the 2nd and 3rd buoy, then back to shore with a little backstroke thrown in. Back on the rocks another bather inquired about what he had heard earlier from my conversation with the ladies. You biked all the way from Lincoln Square, he said? What is that, about 12 miles? I checked w/Cory and told him it was somewhere between 12 and 15. What about you, I asked, did you bike here? Oh I just live down the street. The rock-bathers grew from just a few to over a dozen in the hour we were there. Some teenagers, a serious eastern-European looking distance swimmer, some possible students. Swam, ate pear slices out of tupperware, swam some more, then back on the bikes to head north. We passed back through the prairie restoration project all along the south shore. A Mayor Daley project, apparently. Well, it’s pretty good, I must say. We encountered concert-goers near Northerly Island, holding out fingers to signal the number of tickets they were looking to score. Phish was the band–a younger cousin of the Grateful Dead. We wove our way through them, ringing bells, and kindly shouting out “on your left” as we passed. The crowds were thinning but still strongly present at North Ave and Fullerton. Runners, bikers, families with kids wandering dangerously close to in front of us. A beer was desired and the Clocktower Cafe around Addison proved to be the perfect spot. A quiet deck overlooking early evening golfers. It all felt right so I added a portobello sandwich to my order and fed myself. Back on the path, I parted ways with my companions at Wilson and worked my way through Uptown towards home. Just as I walked in the gate I felt the first raindrops coming down. They fall quietly now, as I sit, freshly showered, content from my day.